Abstract: Multi-Terminal high voltage Direct Current (MTDC) transmission lines enable radial or meshed DC grid configurations to be used in electrical power networks, and in turn allow for significant flexibility in the development of future DC power networks. 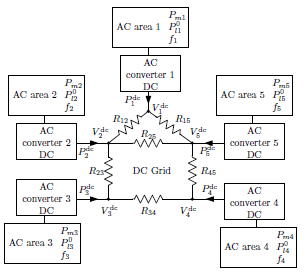 In this paper distributedMPC is proposed for providing Automatic Generation Control (AGC) in Alternating Current (AC) areas connected to MTDC grids. Additionally, a novel modal analysis technique is derived for the distributed MPC algorithm, which in turn can be used to determine the convergence and stability properties of the closed-loop system. Reference: P. Mc Namara, R.R. Negenborn, B. De Schutter, G. Lightbody, S. McLoone. Distributed MPC for frequency regulation in multi-terminal HVDC grids. Control Engineering Practice, vol. 46, pp. 176-187, January 2016.